Back by popular demand for 2019 the Brean series are three superb tents that are ideal for touring, couples and family use. They offer fantastic headroom for a compact sized tent and utilise fibreglass poles for a lightweight and easy setup. The shape of the tent creates a good standing height with plenty of headroom and the light grey daylight panel keeps an easy on the eyes white light within the tent. The built in front canopy creates a wet weather entrance, protecting the front of the tent from inclement weather. Looking from the outside, a side entrance can be found on the right hand side panel. This side door can be zipped back to a secondary large mesh panel to allow a breeze through the tent, whilst keeping our those pesky insects! Other ventilation can be found on the left hand side panel above the window, above the front door, and at the rear of the tent. 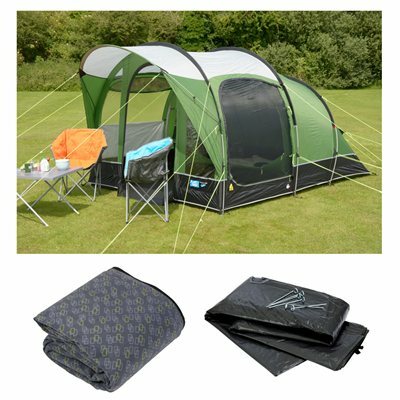 All of the ventilation can be closed, with the exclusion of the front vent which is covered by the front canopy, and all vents are found at high points of the tent to expel rising hot air and help prevent condensation within the tent. Keeping to the high quality of Kampa tents, the Brean series features a fully sewn in groundsheet and on the six berth version the inner tent is divided by a curtain that can be rolled away if not required. An organiser can be found on the front wall of the inner tent and more private organiser pockets can be found inside. The combination of the colour scheme on the flysheet and inner tent creates a relatively darkened area within the tent for a better night sleep and the windows feature easy to stow blinds that can be tucked away into deep storage pockets when not in use. Bought this tent as I wanted a tent I can stand up in and had a sewn in groundsheet to keep the bugs out. This is a great tent , very easy to put up great for me and the dog camping. Ordered it online and was delivered a wk later, excellent service from camping world. This tent is ideally. Good size ( incl height) light weight and easy to pitch. We bought it to sleep with two adults in it. Sleeping position in inner tent can be adjusted to surface. Hope this year the summer is beautiful to be able to fully enjoy the tent. Product just what I was after, ordered online, delivery was within time scale. Customer service helpful.